On this date in our family history . . . the 18th day of November . . . in the year 1896 . . . probably somewhere in Maine . . . a baby girl is born . . .
She is raised as Helen F. Brackett, and is said to be the daughter of Peter Brackett (1838-1927) and his wife, Elizabeth J. "Lizzie" Merrill (1841-1911). 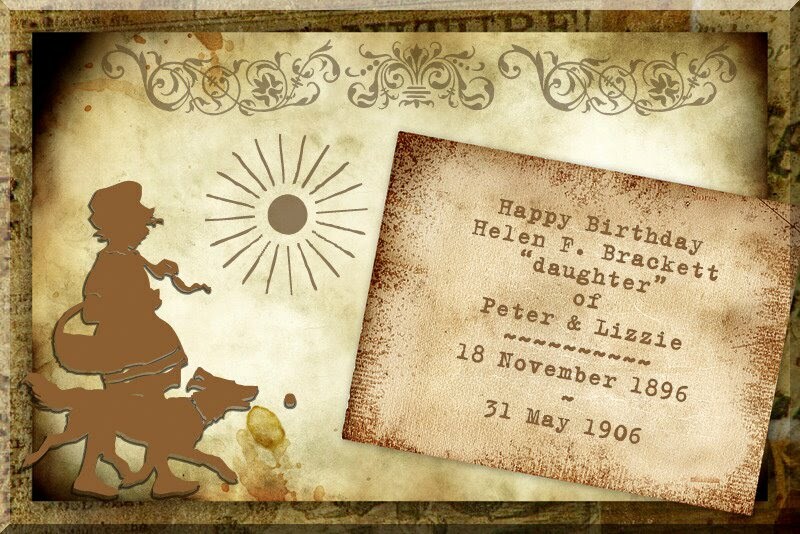 At the time of Helen's birth, Peter is 58, and Lizzie is 55 years of age. For many years, it was believed that Peter and Lizzie were the birth-parents of Helen's older "sister" -- Eva May Smith (1874-1936) -- until the family lore from Maine was passed on to the Texas descendants that Eva May was actually the daughter of Lizzie's younger sister, Phoebe (1848-1927). Eva May is a maternal great-grandma of the Keeper of this blog. Even before receipt of this info -- due to the age of Peter and Lizzie at the time of Helen's birth, as well as the gap of almost 23 years between the birth of their two "daughters" (and only children) -- there were questions about Helen's true parentage. begotten and not forgotten . . .
On this date in our family history . . . the 1st day of November . . . in the year 1946 . . . William Allec Hilton and his seven crewmates boarded a B-17 Flying Fortress at Capodichino AirField in Naples, Italy, and flew out, heading for Bovington, England . . . they never arrived . . . the following areas were diligently searched . . . Isle of Corsica, Ligurian Sea, Tyrrhenian Sea, Swiss Alps, Frech Alps, Rhone Valley to Paris (over an area 75 miles wide), an area 75 miles wide from Paris to Bovington . 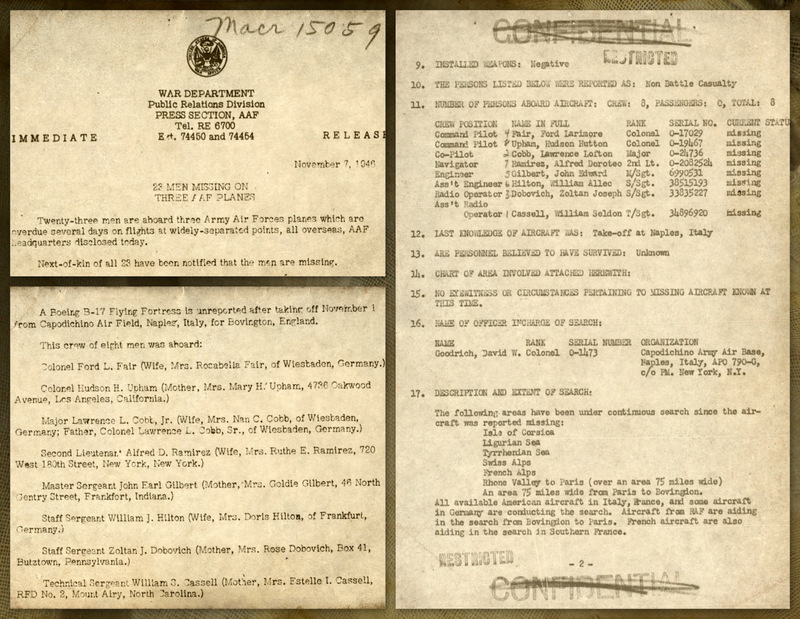 . . all available American aircraft in Italy, France, and some aircraft in Germany conducted this search . . . aircraft from RAF also aided in the search from Bovington to Paris . . . French aircraft also aided in the search in Southern France . . . these searches continued for 18 days . . . they were futile . . . more than nine months later . . . on the 25th day of July 1947 . . . a patrol of the 99th Infantry Battalion Alpine discovers the remains of the aircraft on the mountain Aiguille Glacier, a glacier at 3750 meters, 15 miles southwest of the summit of Mont Blanc . . . some aircraft debris and human remains identify the device . . . the causes of the accident appear to be related to bad weather . . . at the scene of the accident, a propeller blade stuck in the rock where the plane crashed serves to climbers as a place to hang their ropes . . . this William is a son of Isaac Cleveland Hilton (1888-1947) and Louisa Hooper Hilton Roberts nee MUSTON (1893-1973) . . . and he is a 1st cousin twice removed to the Keeper of this geneablog . . . visit William's findagrave page to view the monument at Arlington National Cemetery listing the names of the members of this crew . . . the recovered remains were buried here on 10 October 1947 . . . FYI . . . some of this information was translated by Google from a French internet page . . .
Norman and Carol Ann (Mulholland) Parr are the late in-laws of one of my New England cousins -- actually a 2nd cousin once removed. I re-established contact with cousin Kristin in 2009 by way of Facebook, after basically being out-of-touch with that entire branch of the family for an entire decade. She had posted a note on her Facebook page in memory of her deceased in-laws (a family story previously unknown to me). I did some research on Google, and found numerous articles mentioning the Parrs, who had apparently been invited to share the home of friends in the face of the impending storm. I also found tributes posted by their son, who shared these photos of his parents. Remembering with and for them . . .
and into that pasture again . . .
thank you for holding onto that moment in time . . .
My acre of heaven . . . Sailing the waves of past . . .
Yuletide without the Flight . . .
Meadows of Heaven . . .
and the silvery mist of the meadows. On this date in our extended family history . . . the 14th day of August . . . in the year 1872 . . . Joseph Vick of Lexington, Texas sat down to pen a letter to his Aunt Amanda back home in Oktibbeha County, Mississippi . . . this is just one in a series of letters to Aunt Amanda by kith 'n kin who left a war-ravaged Mississippi following the years of the war between the states . . . hoping for a better life in Texas . . . I take my seat this evening to write you a few lines to let you know that we are not all well at this ? I had a chill abot a weak ago Mat has been having some chills but is not now Belle had one today for the first . . . Almost everybody out here has had some chills this summer but there is but very little fatal sickness I dont think that I have heard of a single case. Please excuse bad writing and spelling. This is one of the family photos I would luv to be able to use for The Family Curator's Genealogy Photo Challenge for World Photography Day . . . first problem is the location is unknown . . . second minor problem is that it was taken somewhere in New England, presumably on the coast of Maine . . . and I'm in Texas! . . . anyway . . . The photo I took for today for my photo-a-day blog was used to create a background texture that just called out for a beach collage of some sort . . . so I put this one together . . . the mini postcards show scenes from Peaks Island . . . and the young girl with the long dark curls is my maternal grandma, Elizabeth Marilla Henry nee Smith (1912-1932) . . . the names of her friends are not known . . . you are welcome to use this texture for a project of your own . . . just let me know so I can see what ideas you come up with! On this date in our extended family history . . . the 23rd day of May . . . in the year 1890 . . . Colonel John Trousdale Coffee dies in Georgetown, Williamson County, Texas . . . and is buried in the IOOF Cemetery in that town . . . this CSA Colonel is the husband of Eunice Margaret Amelia Vontress Coffee nee Allen (1838-1919) . . . who is a granddaughter of Elisha and Patsy (Gill) Roberts . 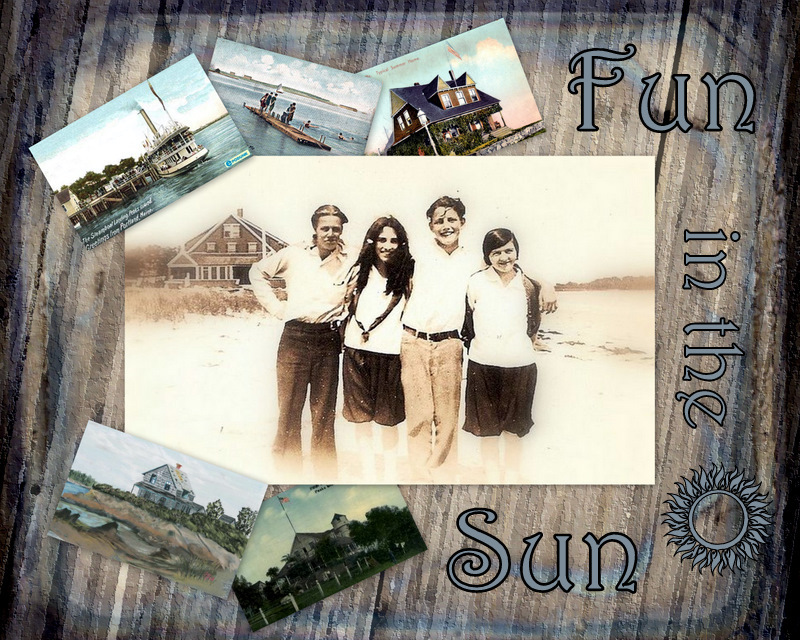 . . who are 4th great-grandparents of the Keeper of this family history blog . 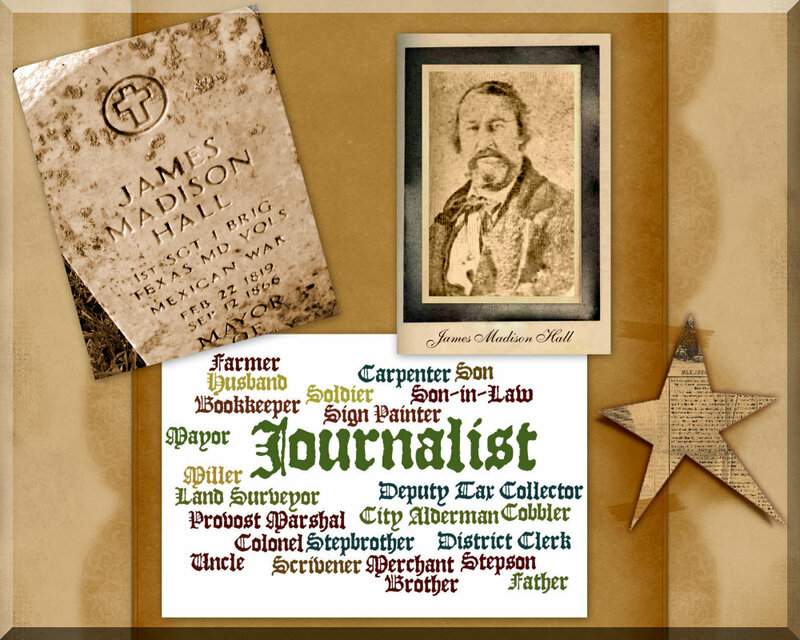 . .
Labels: 19th Century, Cemeteries, Civil War, Gill, Hall Kinfolk, Maternal Kinfolk, Month of May, Roberts, Texas, Williamson Co.
On this date in our extended family history . . . late in the day on the 10th of May in the year 1902 . . . John Connell, Jr. bleeds to death from a knife wound following an unfortunate domestic disagreement with his son and namesake, John Connell III . . . the decedent is a 1st cousin four times removed to the Keeper of this family history blog . . . the Connell killing and subsequent legal proceedings are mentioned in numerous issues of the Dallas Morning News . . . the following biography is from A Memorial and Biographical History of McLennan, Falls, Bell, and Coryell Counties (Chicago: Lewis, 1893; rpt., St. Louis: Ingmire, 1984) . . .
J. H. Connell, a capitalist of Belton, was born in San Augustine county, Texas, when Texas was a province of Mexico, April 3, 1833, son of John H. and Matilda T. (Roberts) Connell, natives of Pennsylvania and Kentucky respectively. John H. Connell's father, a native of Ireland, came to America at an early day and settled in Pennsylvania, where he followed his trade, that of blacksmithing. John H., leaving home when a youth, came in 1826 to Texas and engaged in the mercantile business near Austin, where he was married in 1830. 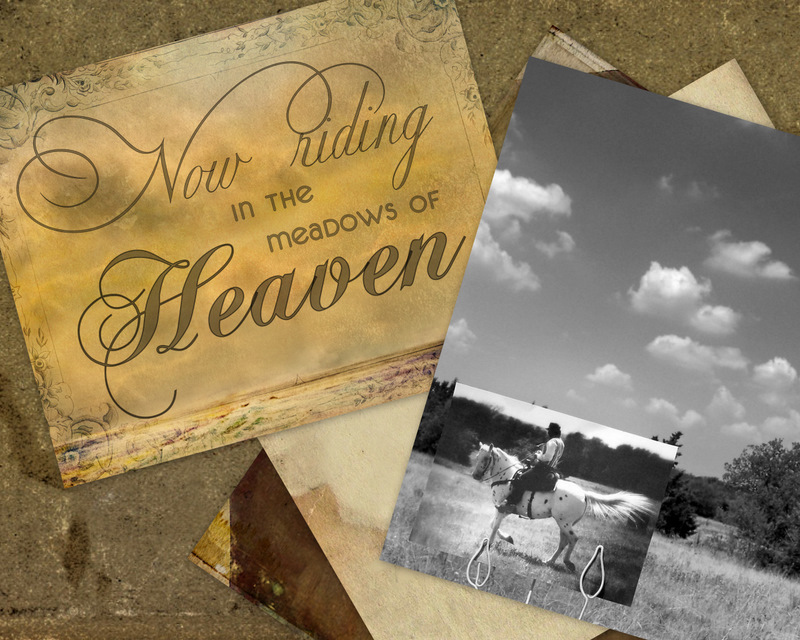 Mr. Connell came to Texas with Sterling C. Robertson, and both secured large tracts of land. The Roberts family were also among the pioneers of this section of the country. Elisha Roberts [4th great-grandpa of the Keeper of this blog] went from Kentucky to Louisiana in 1819, and in 1820 came to San Augustine, Texas. Elisha Roberts was one of the earliest settlers within the confines of the State. Mr. Connell died at Viesca in 1834. He was truly a self-made man, and during his lifetime acquired considerable property. Belton is located on a portion of the land on which Mr. Connell once lived. Mrs. Connell having donated to the county of Bell 120 acres, in 1850, on which to establish the county seat. John H. Connell and his wife were the parents of two children: Josephine, wife of Anderson Hamblin, both being now deceased; and J. H., the subject of our sketch. After the death of Mr. Connell, Mrs. Connell was married in 1835, to Samuel T. Allen, of New York, and their union was blessed in the birth of two children: Thomas R., deceased; and Eunice A., widow of Colonel John T. Coffee, of Missouri. Samuel T. Allen was killed by the Indians at the three forks of the Trinity, in November, 1838, and in the fall of 1847 Mrs. Allen married his brother, Thomas J. Allen. Her death occurred April 3, 1879, at the home of her daughter, Mrs. Coffee, in Georgetown, Williamson county, this state. The subject of our sketch was reared amid the frontier scenes of what is now San Augustine, Milam, Williamson and Galveston counties. In 1854 he went to California, making the trip from Galveston by water; spent two years in the southern part of the Golden State, and while working in the mines lost his health. He was, however, financially successful. Returning home in the latter part of 1855, he engaged in farming and stock-raising in Texas up to the year 1861. The war coming on in that year, he joined the Confederate forces; was in the Trans-Mississippi Department, and participated in numerous skirmishes and battles. Returning to his home in the latter part of May, 1865, Mr. Connell set about repairing his wasted fortune, and with renewed energy engaged in his old occupation of farming and stock-raising. He continued his operations in Williamson county till January 28, 1884, when he rented his farm and moved to his property in Belton. He owns considerable valuable real estate, his Belton home place consisting of some 250 acres adjoining town. He has a handsome residence, an intelligent family, and is comfortably situated to enjoy life, having practically retired from active business. Mr. Connell was married September 15, 1869, to Miss Jennie Howlett, a native of Texas, born in Milam county, October 5, 1844, daughter of James and Sarah (Moore) Howlett, natives of Kentucky and Tennessee respectively. 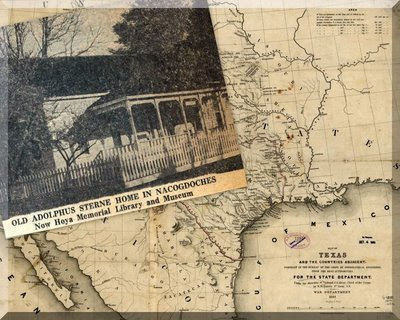 Both the Howletts and the Moores were among the early pioneers of Texas. Mr. and Mrs. Connell are the parents of five children: John H., Jr., T.E., Susan, May T. and Albert L. T.E. is now a student at the State University of Texas. Mr. Connell and his wife are consistent members of the Methodist Episcopal Church South, and are held in high esteem by all who know them. Labels: 19th Century, Bell Co., Connell, Maternal Kinfolk, Month of May, Roberts, San Augustine Co.
Monday, May 1 at 1:10 p.m. marked the passing of one of earth's dearest and sweetest little mothers, Mrs. M.A. Nettles. She was born near Starkville, Mississippi, October 24, 1852, daughter of Richard and Sarah Mildred (Carter) West, and christened Mary Annie, but known practically all her life as Mollie. She was nine years old when the Civil War began and many were the interesting tales she told concerning it. In 1869 her family, together with several other families, came to Texas in wagons drawn by oxen and settled in and near Lexington. She had lived on the home place with her eldest son, Will, until February of this year, when she went to Lott to make her home with her youngest child, Joe, and family. It was here, following an illness of bronchial pneumonia, that she passed to her reward. The last six or eight months of her life was spent mainly in bed, but she was given loving and careful attention and was a sweet and patient sufferer. From the wisdom of her years she gave counsel, advice and help to all who sought it, and truly will she be greatly missed by all who knew and loved her. Pat Carter and son, Pat Jr. The last named was her constant attendant after moving to Lott, and truly a grand-daughter could have been no sweeter to her own grandmother than Annie Lou was to Grandma, who lovingly called her my girl. Present also was Mrs. Richard Mundine Sr. of Taylor, an old friend of the family. This post is all because of Joan . . . who posted the following comment on my photo blog . . . Doggonit, Vickie, even your charts are works of art. I am wishing that you were my muse. . . . then it dawned on me that there is no reason to have a plain black and white kinship chart hanging there, when I can have a vintage looking chart that is actually pleasing to the eye . . . so I put one together this a.m. . . . and here's a copy for any of y'all who want to use it . . . and if you would also like to have a plain black and white PDF version, just send me an email asking for the PDF relationship chart, and I'll send one to you . . . benotforgot at gmail dot com . . . FYI . . . the accompanying text is freshened up a bit from a post that I originally shared more than ten years ago on my password-protected sites at myfamily . com [retired] . . .
Click on the above chart to open an enlarged view in a separate window. Your first cousins are those people in your family who have two of the same grandparents as you, i.e., they are the children of your aunts and uncles. 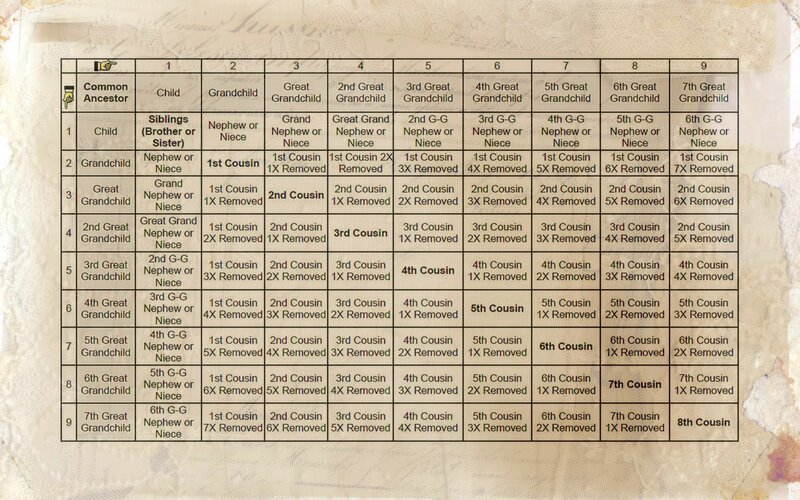 Your third cousins have the same great-great-grandparents, and so on. When the word removed is used to describe a relationship, it means that the two related people are from different generations. You and your first cousins are in the same generation (both two generations younger than your grandparents). Your mother's first cousin is only one generation younger than those same grandparents, so your mother's first cousin is your first cousin, once removed. To identify the exact degree of kinship between any two related people . . .
Identify the common ancestor of the two people, i.e., find the direct ancestor of individual #1 who is also a direct ancestor of individual #2. The box in the upper left corner of the chart is that common ancestor. Across the top row of the chart, find the relationship of individual #1 to the common ancestor. Down the left edge of the chart, find the relationship of individual #2 to the common ancestor. Read down the column of the individual #1 and across the chart on the row of individual #2. Where the two rows intersect is the box which identifies their relationship. For example . . . for the Common Ancestor, I am using Christopher Clark who was born in 1681. By the middle of the 19th century . . .
Christopher's daughter, Agnes, has a great-great-grandson by the name of Samuel (1835-1910) . . .
Agnes' sister, Elizabeth, has a great-great-granddaughter by the name of Josephine (1842-1899) . . . this Josephine is my 2nd great-grandma, who had lived in Milam Co. TX (where I was born & raised) for more than two decades by the time of her death in 1899 . . . Since Christopher was the g-g-g-grandpa of both Josephine and Samuel, this puts them both in Column #5 (as his 3rd great-grandchildren) . . . which makes them 4th cousins to each other . . .
As the 2nd great-granddaughter (me) of the 2nd great-granddaughter (Josephine) of Christopher's daughter, Elizabeth, I am the 7th-great-granddaughter of Christopher . . . this puts me in column #9 . . . 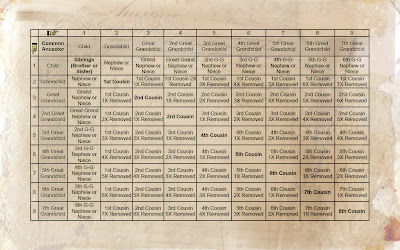 If you follow Samuel's Column #5 down until it intersects with my Column #9, you will find that I am the 4th cousin four times removed to this Samuel . . . who was sometimes known to use the AKA of Mark Twain . . . I assume most of y'all use some type of family tree program that computes your relationships for you . . . I know I do . . . but I still like to keep this chart handy . . . for doing simple computations . . . or for verifying that I am remembering a relationship correctly . . . FYI . . . the following explanation of Grand and Great was found somewhere on the WWW . . . more than 10 years ago . . . I like the way it explains the greats and the grands . . .
GRAND . . . Grand is a prefix added to represent one generation of separation . . . the father of your father, for instance, is still a father to you . . . however, there is one generation between the two of you . . . so he is a grandfather to you . . . and you are a grandchild to him . . . this term is most commonly applied to fathers and mothers . . . but it can also be used to define other relationships . . . such as a Grand Uncle or Grand Aunt . . . i.e., a brother or sister of your grandparent . . .
GREAT . . . Great is a prefix that is added to represent two generations of separation . . . if Grand is one generation of separation, then Great-grand (i.e. 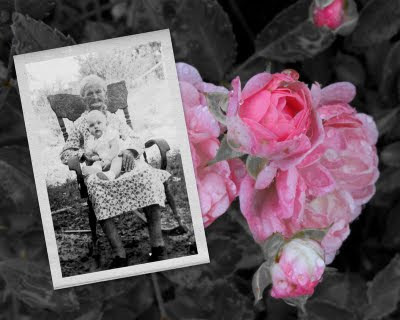 great-grandmother) is two generations of separation . . .
For every generation of separation above one (Grand), there is a Great added to represent each additional generation of separation . . . your father's grandfather is 3 generations separated from you . . . so he would be your Great-Great-Grandfather . . . the Grand and two Greats represent the 3 generations of separation . . . This prefix can also be used to define other two-plus generational relationships, like Great Aunt, or Great Uncle . . . as noted, the Grand is more commonly left out (Great Aunt instead of Great Grand Aunt) when referring to relationships other than father and mother . . . It is common, once you go beyond a Great-Great-Grandparent, to refer to the Greats by number . . . for instance, your Great-Great-Great-Grandfather would be called your 3rd Great-Grandfather . . . and written as G3-Grandfather, GGG-Grandfather or something similar . 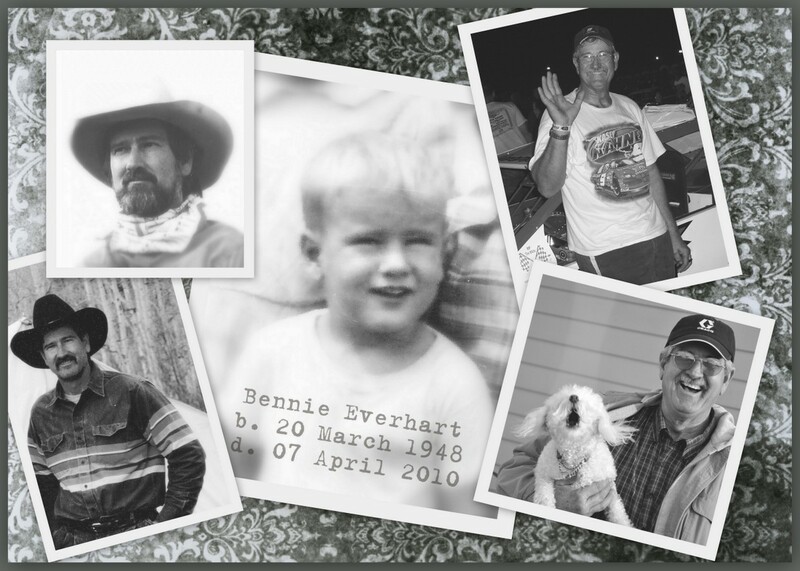 . .
Labels: 20th Century, Bennie 1948-2010, Birthdays, Memes, Texas, Travis Co.
Today (16 March 2011) marks the 3rd anniversary of the day I started blogging here on blogger as benotforgot . . . two years ago, on my 2nd blogiversary, I wrote about some of my blog firsts in THIS post . . . but . . . if you go by the following definition of a blog, I guess you could say I've been blogging since 1999 . . .
blog - website that allows users to reflect, share opinions, and discuss various topics in the form of an online journal while readers may comment on posts. . . . Entries typically appear in reverse chronological order. October 2004 is when I set up a proboards site for the purpose of posting about my genealogy on a site that was NOT password-protected . 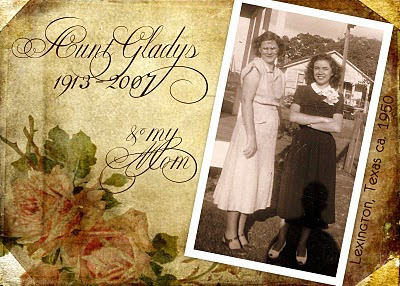 . .
16 March 2008 is when I started posting on this blog about some of my ancestors . . . So . . . while I've only been here on blogger for four years now . . . by the definition given above, I've actually been blogging for 13 years . . . with no plans to stop any time soon . . . e-y'all later . 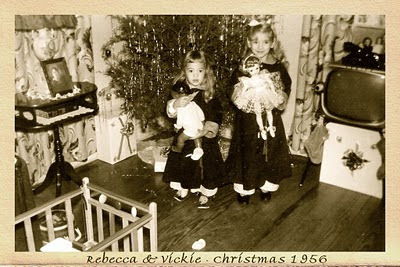 . . Vickie E. . . .
Seventy-five years ago today . . . on this date in Texas history . . . the 2nd day of March . . . in the year 1936 . . . celebrations are being held across the state in honor of the 100th anniversary of Texas Independence. My Mom . . . the daughter of a long line of Texans on her father's side, and an even longer line of Mainers on her mother's side . 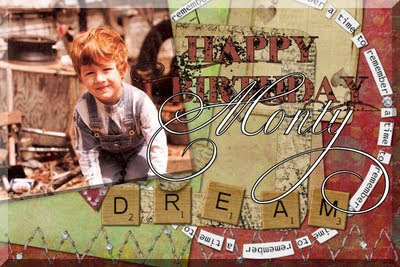 . . was four years old . 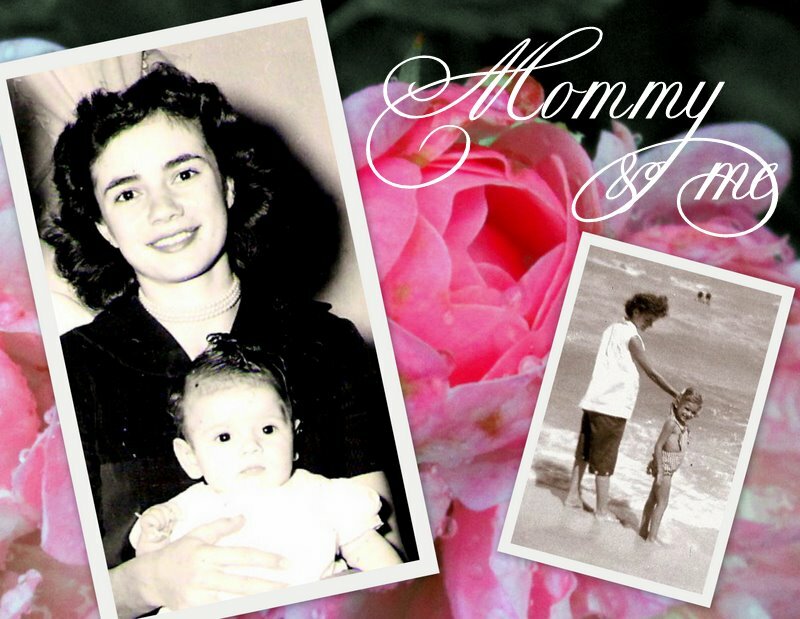 . . and living in Massachusetts with her widowed father and maternal grandma . . . her paternal grandparents were living in Runnels County, Texas . . . she had no living great-grandparents . . . Mom would take up permanent residence in Texas sometime before 1940. My father . . . whose ancestors had started arriving in Texas ca. 1860 . . . was an eight-year-old living in Lee County, Texas . . . with his parents and one sister and a brand-new baby brother . . . his widowed maternal grandma and his paternal grandparents were living in the same area, as well as one great-grandma . 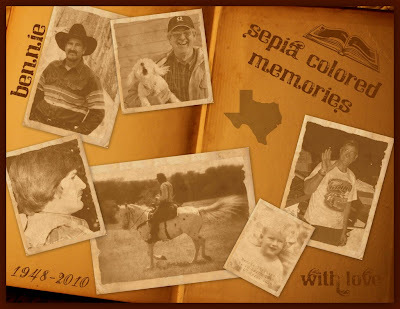 . . a great-grandpa was living in Coke County, Texas at the time . . .
FYI . . . the background image is a free blogger template . . . the Centennial banner is scanned from a 1936 Centennial newsletter in my private collection . 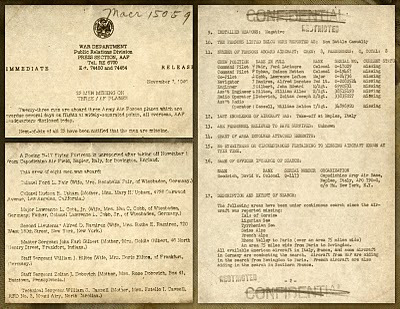 . . the postage stamps were issued in 1936 (Centennial) and 1945 (statehood) . . . the postcard caption for the lighted night scene says . . . The lagoon and fountain at night, Texas Centennial Exposition, Dallas . . . the back of the same card says . . . The Lagoon and Fountain at Night, all artificially built, with its ever-changing colors and reflections, shows what can be accomplished by mere man with just a little effort. . . . the card was printed by the Dallas Post Card Co., Dallas, Texas . . .
On this date in our extended family history . . . the 26th day of February . . . in the year 1849 . . . James Jefferson Henry is born in Cedar County, Missouri . . . this "Jeff" Henry is a 1st cousin four times removed to the Keeper of this family history blog . . . and while Googling for information about my Henry kith 'n kin, I found the following information at Google Books . . . from History of Kentucky by Charles Kerr, William Elsey Connelley, Ellis Merton Coulter . . .
Jefferson Henry may consistently be designated as the honored dean of the bar of Green County, and during the course of his long and successful professional career he has been identified with much of the important litigation in the various courts of this section of the state. Though he is not a native of Kentucky, he is a scion of one of the old and honored families of Green County, this state, his paternal grandfather, Belfield Henry [my 4th great-grandpa], a native of Virginia, having been comparatively a young man when he came to Kentucky and numbered himself among the pioneer settlers of Green County, where his death occurred a number of years prior to the birth of the subject of this review. He became one of the extensive land-holders and farmers of the county, and prior to the Civil war owned a large number of slaves. He was of Scotch-Irish lineage, and the original representatives of the family in America came from Ireland to Virginia in the Colonial era of our national history. Belfield Henry married Miss Elizabeth Kirtley [my 4th great-grandma], likewise a native of Virginia, and both were well advanced in years at the time of their deaths. Jefferson Henry, who is familiarly known by the abbreviated name of "Jeff," was born in Cedar County, Missouri, on the 26th of February, 1849, and is a son of James L. and Margaret (Brownlee) Henry, both natives of Green County, Kentucky, where the former was born in 1811 and the latter in 1810. 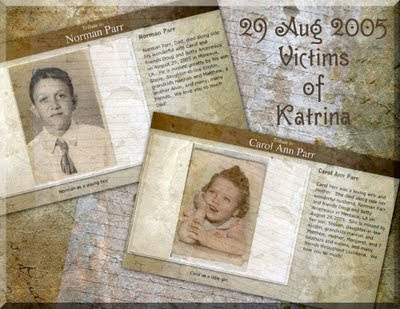 The father died at Canehill, Arkansas, in 1871, and the mother subsequently passed to the life eternal at Burnet, Texas. James L. Henry was reared and educated in Green County, and here became a successful agriculturist and stock-grower. In 1840 he removed to Cedar County, Missouri, where he became the owner of a large farm estate, including a stock ranch, and where he maintained a force of thirty or forty slaves in his extensive operations as an agriculturist and stock-grower. Malvina became the wife of Dr. A. J. Culberson, a leading physician at Burnet, Texas, and there her death occurred. Malvina [sic] became the wife of William E. Culberson, and both died at Burnet, Texas, where he had been engaged in a mercantile business for a long period. T. A., who was for many years successfully identified with the banking business, died in 1919, at Red Fork, Oklahoma. The above record shows that the subject of this sketch is now the only surviving member of this family of children. The rural schools of Missouri and Texas afforded Jefferson Henry his preliminary education, and after the removal of the family to Canehill, Arkansas, he there attended the high school two years and the Canehill College for an equal period. In the meanwhile he had applied himself also to the study of law, and on the 22d of January, 1872, he was admitted to the bar of Kentucky. In that year he established himself in practice at Greensburg, where he has since continued as one of the leading members of the Green County bar and where he has long controlled a large and representative law business, which has extended into both the civil and criminal departments of law and recorded the winning of many court victories of important order. Mr. Henry is a man who has ever been a student, and his reading and study have covered a remarkably wide range, with the result that his cultural powers are of the finest type and his intellectual horizon very wide. At his pleasant home, known for its generous and unpretentious hospitality, he has one of the best private libraries in Kentucky. His law offices are maintained in the Henry Building, of which he has been the owner since 1878, and which is situated on the west side of the courthouse square in Greensburg, his modern residence being at the corner of Main and Cross streets and being one of the finest in the city. In addition to these urban properties Mr. Henry is the owner of a well-improved farm on the rich bottom lands at the mouth of Big Russell Creek, Green County. He has always adhered to the ancestral political faith and is a leader in the ranks of the democratic party in this section of the state. He served eight years as county attorney of Green County, but in the main has had no desire for public office, as he has preferred to give his undivided attention to his large and representative law practice. Both he and his wife are active members of the Presbyterian Church in Greensburg. The perennial youth of Mr. Henry has been largely due to his vital interest in men and affairs, and the questions and issues of the hour receive his appreciative attention. Thus it was to be naturally assumed that he would take a prominent part in the various local war activities when the nation became involved in the great World war. He was chairman of the advisory board of Green County, served on other war committees in the county, aided in the various campaigns in the sale of war bonds and savings stamps, and to the full limit of his means he subscribed to these issues and gave earnest support to Red Cross and Salvation Army service. December 12, 1872, recorded the marriage of Mr. Henry to Miss Josephine L. Perry, daughter of Joseph and Elizabeth (Tebbs) Perry, of Green County, where both continued to reside until their deaths, Mr. Perry having long been a substantial capitalist and leading banker of Greensburg. Mr. and Mrs. Henry have but one child, Claudia, who is the wife of Early Vaughan, a successful farmer near Greensburg. On this date in our extended family history . . . the 22nd day of February . . . in the year 1819 . . . James Madison Hall is born in Baltimore, Maryland . . . my known connections to this James Madison Hall include . . .
he is my uncle by way of his 1859 marriage to my 2nd great-grand-aunt, Margaret A. Hall Stewart nee Sharp (1840-ca. 1878) . . . and . . .
he is my step-uncle because he is the stepson of my 3rd great-grandma, Mahala Lee Sharp Hall nee Roberts (1816-1885) . . .
which makes him the step-brother of my 2nd great-grandpa, Samuel Houston Sharp (ca. 1839 - ca. 1885) . . .
who is the brother of Hall's wife, Margaret (mentioned in #1 above) . . . This Uncle James . . . who wound up in Texas by the age of sixteen (1835) . . . and began his involvement with my family at least as early as 1851 . . . which was when his father married my widowed 3rd great-grandma . 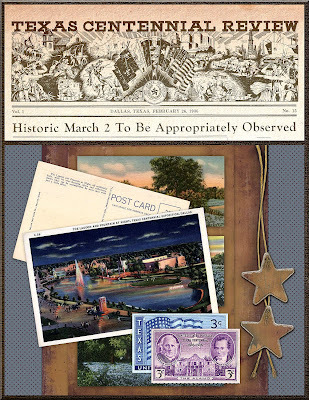 . . was thoughtful enough to give me seven years worth of material for a blog about life in Texas during the years of the war between the states . . . because he kept a daily Journal during the years 1860-1866 . . . and in those daily ramblings of his he made frequent mention of an assortment of my kith 'n kin . . . soooo . . . with this time period (2011-2015) being the Sesquicentennial of the Civil War . . . I began transcribing this Journal on the 150th anniversary of the day he penned his first entry in that 19th century ledger . . . and, almost one year ago, I told about my first encounter with the original of that Journal in this blogpost . . .
Tombstone photo shared by sjmj at findagrave.com . 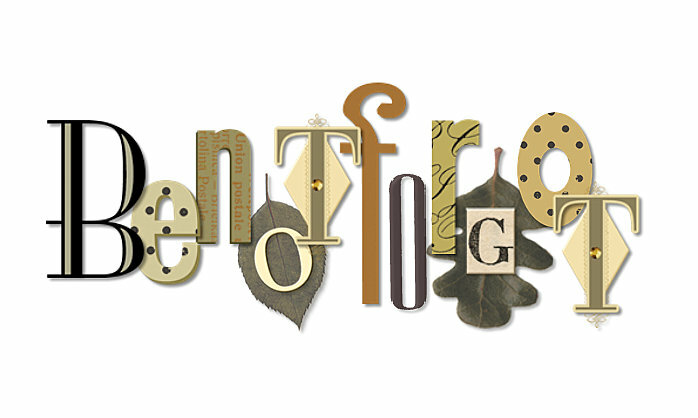 . . word collage prepared at wordle.net . 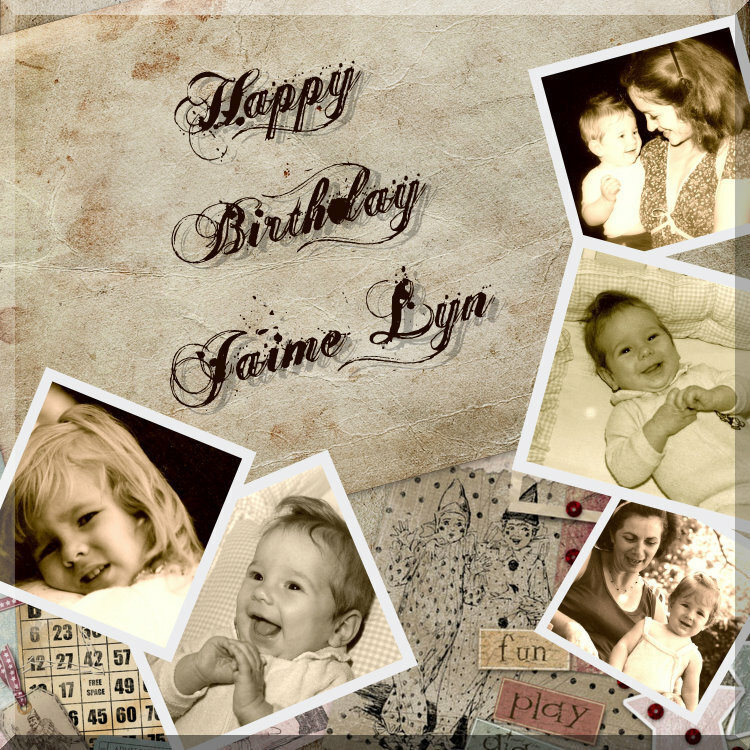 . . free background image from Daisy Gray Design . . . James Madison Hall photo from Aldrich book on The History of Houston County, Texas . . .